After being given bad intel that could have killed the entire team, Robin came to the conclusion that the person who gave them the intel must be in league with the secret criminal mastermind, the Other. However, this person is no mere informant, it’s the Red Hood. So naturally, Damian has a great idea to get information on Red Hood: break into the Batcave. Back in the cave, the Titans have disabled the alarm, but it is already too late. From behind, they are attacked by what looks to be Batman. Meanwhile, Damian is still arguing with Alfred. While Damian is telling Alfred that Jason betrayed the family, Alfred reassures Damian that Jason may handle things differently than everyone else, but he is always on their side. Damian then gets aggressive, warning Alfred not to try to fight him. “…you sound just like him. I could never protect your father from himself either. I suppose some lessons are meant to be learned the hard way”, remarks Alfred. Damian replies, “My father is a fool. I’m nothing like him. There are more heroes now than ever before, yet somehow things aren’t getting better. They’re getting worse, Alfred.” When Alfred tries to reassure Damian that things will get better, Damian interrupts and tells Alfred that the heroes need to start fighting dirty. “If chaos is what it takes to clean the slate, then so be it. We can rebuild from the rubble.” “It seems I was wrong. You don’t sound like your father…You sound like Ra’s Al Ghul.” Being compared to his criminal grandfather is enough to make Damian leave the manor and return to the cave to see his team being beaten by Batman. As the Dark Knight closes in on Roundhouse, Robin springs forward and cuts “Batman’s” head off. It turns out that this Batman is nothing more than a security robot meant to protect the cave. 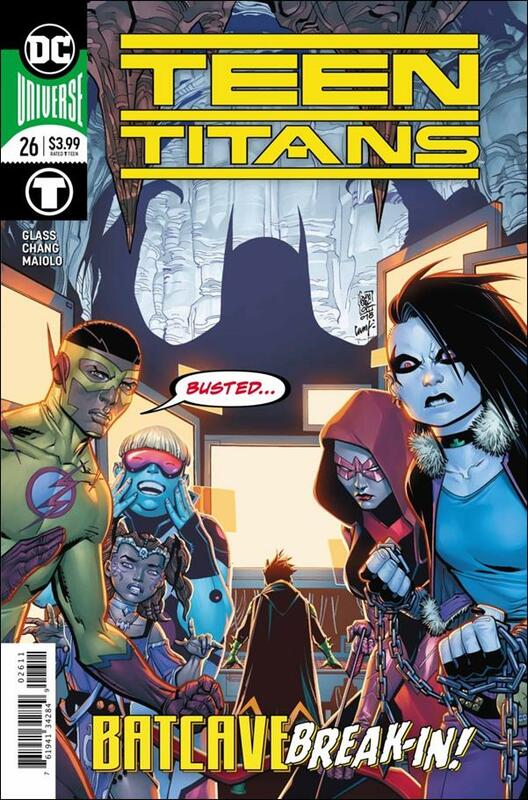 Roundhouse reveals that the Teen Titans now have full remote access to the Batcave systems and the team leaves. Later, in Robin’s secret supervillain prison, Red Arrow stops Robin from being attacked by Black Mask. The two of them talk and decide on what the next move for the team should be. Together, they decide that for them to defeat the Other, they first need to take out Red Hood. Well it looks like the Bat family is no closer to getting back on the same page. The readers can safely bet that Red Hood wasn’t behind the attempted killing of the Titans, so when will Damian realize that? It seems all the character development Damian has had over the last few years is being swept aside for him to act more and more like his grandfather. Hopefully when he realizes that Jason didn’t set him up, they can work together and bring down the Other, and Damian can start acting like a hero again instead of a spoiled punk. While not a bad issue, it highlights an issue I have with the current way comics are released: inconsistently. I know that storylines across multiple titles won’t always line up, but there are some moments when they need to. In Teen Titans, you have Damian arguing and even threating to fight Alfred while calling Bruce a fool, but in Detective Comics, Damian is watching over Alfred while he heals and wants to repair his relationship with Bruce. That kind of inconsistent writing makes it harder for readers to care about what is going on. If you don’t like how Damian is treating the family in one book, just pick up another and he’s completely different. It’s almost like we’re reading two completely different characters that are supposed to be the same person. Unfortunately, that’s a universe-wide issue, not just a problem in a handful of books. In any case, not a bad issue of Teen Titans. I just hope that Damian stops acting like an Al Ghul and starts acting like a Wayne again soon.